If you live in a country that has no seashore, you could get desperate if you have a passion for surfing. As we ourselves are from Austria, we know what we are talking about – the addiction to the ocean has made us travel far distances to be able to ride some waves. That this is not a very sustainable practice is obvious, especially if you are limited in time and travel by plane (see more in our blog post “Sustainable travel”). And sometimes there are also other reasons why a surf trip to the ocean is impossible. However it is not a secret anymore that there are also surf options far away from the coasts. We want to have a closer look at the different alternatives. Once upon a time … yes this sounds like a fairy tale: when our grandparents were young in the alps there existed already something similar to riversurfing! However trying your luck on a wooden door fixed on the river doesn´t sound too promising as an alternative of (ocean) surfing. Surfing on the Eisbach however does and so this river wave also managed to make surfing on a standing wave famous worldwide. 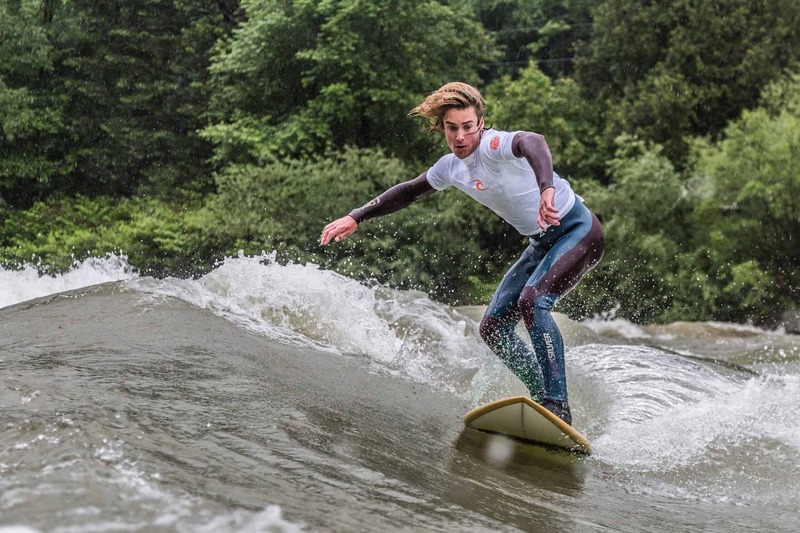 And as the sport gets more and more popular, the number of surfable river waves is highly increasing as well, many new spots are getting explored and even projects for artificially created river waves are developed (find a list of many river wave spots below). That even those constructed waves are a very sustainable alternative to a surf trip to the ocean is unquestioned. Depending on the wave, one however could claim that the experience of surfing is very different than the “usual”/ocean wave surfing. In many waters where wakeboarding and waterskiing is common since years, also wakesurfing has arrived. Here the surfer is riding the wake of the boat, which is enlarged with a special rear wait. The speed of the boat is slower than with wakeboarders, so the surfer can make his tricks on the wave without the need of a leash/being towed. As motorboats do need a lot of fuel and have toxic emissions, this surfing alternative is apparently not the most sustainable. If you are interested in this type of surfing, the website of the „Danube Surfers“ in Vienna could be of interest for you, or check out the „Bodensee Wake“ for surfing on the Lake of Constanze in Switzerland. In Innsbruck (Austria) there are not only people working on a standing river-wave (see initative: “Eine Welle für Innsbruck”), but there is also a group who provides another possibility of surfing the Inn-river: “Up Stream Surfing” is a project, where the surfer is towed by a sustainable lift which uses only the power of the river itself. Although we haven´t tried it yet, it reminds us more on wakeboarding then surfing in the ocean. However for sure it is fun anyway- if you are willing to pay for it. Some Videos and more information you can find on their website. Some of you for sure have seen one of the famous videos of Kelly Slaters incredible wave pool (if not, check out this website). It is almost unbelievable that this machine-run wave pool is not only creating the most perfect waves of all times, but is also run by solar energy (at least they say so). And this fun playground for the world best surfers is only one of many wave pools worldwide which provide artificial waves for surfing. Usually they are however not as sustainably built, needing a great amount of power, beside all the other impacts such a big pool brings with it. Then there is also a difference between the wave pools which create running waves (like Kellys or the “Wavegarden” in Spain, the UK and US does) and the ones which provide a standing wave (e.g. Citywave in Vienna), similar to river waves, built in a smaller pool and sometimes even indoor. This fun is of course not for free and in spite of all those disadvantages, it is a possibility to surf if the ocean is far. Some of the projects, like the Wavegarden even promote that this way of surfing is more sustainable than travelling by car. The question is, if it is really replacing any surf trip to the ocean or if it is just a luxurious addition? And isn´t in the end also the atmosphere, the nature and unpredictability of the waves an essential context of surfing? So what is really sustainable? As you can see there are different options for surfing in a country with no coast and all of those options have their advantages and disadvantages. If those surfing-alternatives are sustainable or more sustainable than a trip to the ocean is therefore not so easy to state. Moreover it also depends on how you plan your trip to the ocean and how often you travel to far distances. Our recommendation therefore is: talk to your friends, think of your priorities and options and weigh them with your ecological footprint! We would also be happy to read about your opinion in a comment below!